Q: I just received an email notification stating that my card, used for an online order, was declined – Why did this happen, and how do I fix it? Q: My credit card info is wrong. Can you fix it? Q: What is the difference between the Ladies and Unisex Sizes? Q: Can I use my Textbook Plan to make an Online Order? Q: Why does the choice for an E-Book say “Out of Stock”? Q: If I choose to have an order shipped, how long will it take to reach me and how much will it cost? Q: Do I have to order my Degree Frame online? Q: Why am I not able to order Grad Rings online? Q: What is the easiest way to get in touch with someone at the University Bookstore? What is the Primary form of communication for the University Bookstore? Q: I called but nobody answered. What information should I leave on the voicemail? Q: Hey I can't find my size online. What gives? Q: I didn't get any order confirmation emails. Why not? Q:Do you have a sizing chart? A: When you make an order, you get a confirmation “receipt”. This does not mean that your order has been fulfilled and it most certainly does not mean your credit card has been charged. If your credit card is declined we send you an email notifying you of this. There are a few different reasons as to why your card may have been declined: 1) Either the numbers or the expiry date on your card were typed in wrong; 2) You tried to use an American Express card or Visa Debit card, which we are unable to accept; 3) Your card is not setup for online orders; 4) Your card has been flagged as possibly stolen. To remedy this problem and receive further information, please call our main line at the Bookstore (519-824-4120 x.53715) to provide the corrected information, or an alternate card number. Also please note as a result of this, you will then receive an email notification stating that your order has been cancelled – this is because now your order is considered an internal “phone” order. A: No. Your card is processed securely by Moneris Payment Solutions. The Bookstore doesn’t see your credit card info at all and can’t amend it. You will have to call us. A: The ladies sizes are more form fitting to complement the female figure. The unisex sizes are generally more of a men’s style fit, boxier and looser around the neck, arms and body. A: Unfortunately, at this time we are unable to process the Textbook Plans online. We are working diligently to have this function available soon! Stay tuned to this site as well as our Facebook (www.facebook.com/UofGBookstore) and Twitter (twitter.com/UofGBookstore) accounts for future updates! A: Please look for this item instead under the “E-Book Search” Tab! A: In Canada we normally ship via Purolator express, a bonded carrier, which means you or someone on your behalf will have to sign for the delivery. If you reside in either Ontario or Quebec, you should receive your order within 1-2 business days. If you reside outside of Ontario and Quebec and still within Canada, you should receive your order within 2-4 business days. If you reside in the USA or for any other International Shipment, we use Fed-Ex Shipping Services, and please allow 7-21 business days. Please that should you wish to return you order, your shipping costs will not be refunded. A: No! We will also have a location set up outside of the location where the Convocation ceremonies are held, where we will also be able to frame the degree for you at the time of purchase, for no extra charge. A: It is not a simple process, there are many intricacies involved and we want to ensure that the order is correct. As such, we would prefer that you came into the store, or we would also be able to go through it with you over the phone. Additionally, there will be a representative from Jostens at the convocation ceremony, who will be able to go through the ordering process with you. A: The quickest and easiest way is via email: bookstor@uoguelph.ca or using the online contact us form. Email is also the primary form of communication for the University of Guelph as a whole, so please check your email regularly. A: As a rule of thumb, as much as possible. Key info is your name, number, order number, name of book/course, etc. Messages that only have your phone number will not be returned. A: When the inventory count of a size of a piece of clothing or other merchandise falls below a specified value, the availability of that item disappears from the website. This means that we are out of stock. Q: I didn't get any order confirmation emails. Why not?? A: Order confirmation emails are sent automatically by our system. If you didn't get yours, most likely it is because the system didn't recognize your email. Most of the time when that happens, it's because the email entered is wrong. In certain circumstances, such as Gryphmail addresses, we may be able to fix the error. If you didn't get any email correspondence from us, please contact us. 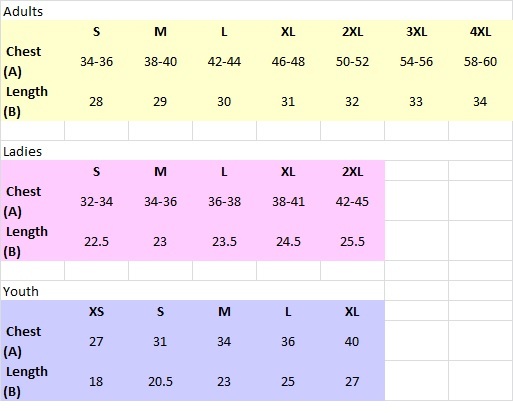 A: Here is the sizing chart from one of our main suppliers. *** PLEASE NOTE SIZES ARE ALWAYS APPROXIMATE, THE GUIDE SHOULD BE USED FOR REFERENCE ONLY *** Sizes are in inches.